Well, I have arrived home from lovely (and warm) St. Pete Beach, Florida safe and sound. The drive was long and very boring. I am notorious (at least to my family) for my car sickness and my inability to sleep in a car. I am rarely ever a passenger and I NEVER ride in the back seat of any vehicle (unless I have an unobstructed view of the windshield). But, a 13 hour ride does mean down time. 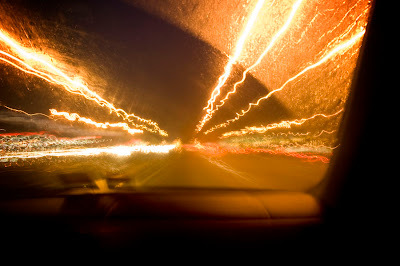 So, to entertain myself, I just took long exposures through the rainy windshield of the car. And from about 100 shots, I actually liked one. Well, my husband and I made a 15 hour drive in our tiny Honda Civic Hybrid from King George, VA to lovely St Pete Beach, FL yesterday. Not a vacation. Well a working vacation. OK. We have started a software business and have come down here for the IACA training conference as a vendor. So, as I sit here behind the booth while my husband works his magic, I blog. While I haven't been able to really go out shooting, we did arrive yesterday right before sunset. 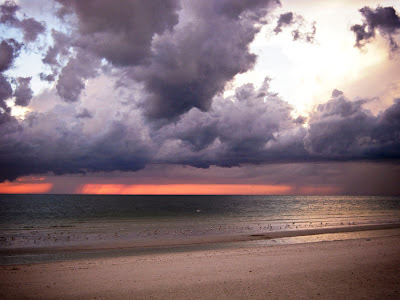 And, as if nature new I needed something after a sleepless night of driving, she threw in a few storms over the setting sun and the Gulf of Mexico. About a year ago, my husband, daughter Alexis (then just nearly 4), and I went to a local produce stand for some pumpkins, flowers, and other lovely things that one can find only from rural road side stands. I was carrying my Holga around quite often then and Alexis always wanted to do what Mommy was doing. She had spotted this huge bright yellow mixing part of a cement truck near the produce stand and wanted to take a picture of it. 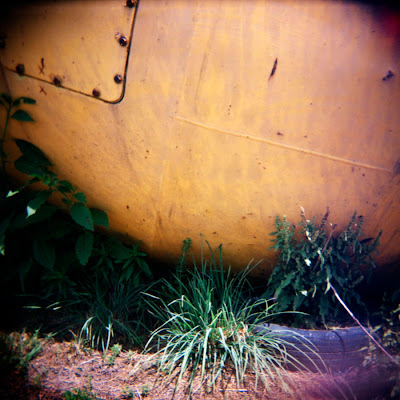 So, when we stopped, I let her have the Holga and she walked over and took a picture. When it was finally developed, my husband and I were amazed at the picture she had taken. It was an instant favorite of ours. Anyway, when the FCCA had a Call for Entry for a national juried exhibition, "Child's Eye View", I knew I had to enter it. Well... I did. And it did. Got accepted I mean. The opening is on November 7, 2008 in Fredericksburg, VA.
Congratulations on your very first show my lovely Alexis!